Starting in Santa Fe during the 2013 Santa Fe Indian Market and moving onto Phoenix for the 2014 Heard Indian Market, Presence 4.0’s third Style Mixer settled in Albuquerque during the Saturday night of the 2014 Gathering of Nations weekend. First and new were the key words of Saturday night. P4 collaborated for the first time with Digital Navajo, a Native owned creative company. Victor Pascual of Digital Navajo was the mastermind of all the graphics for this event and they were nothing short of amazing! Other firsts included giving away gift bags full of goodies and raffle prizes from our wonderful sponsors and supporters – Albuquerque the Magazine, La Loca Magazine, Indian Pueblo Cultural Center, Beyond Buckskin Boutique, Mark Pardo SalonSpa, Notabove Jewlery, Naaltsoos Project, Warren Montoya, David Sloan, and Jeff Slim. Two new faces were also added to the P4 family, Sek Uno of Chicago Tribe and Mona Lisa Rustia. DJ Sek Uno’s set filled the venue with music that made people get on the dance floor while Mona Lisa roamed around capturing images of the night. Essential to it all were the people that attended, a majority of whom were new to P4 Style Mixers. They were either new to P4 or were avid readers of the blog and had not had a chance to attend a P4 event. Regardless, everyone was dressed to their best! 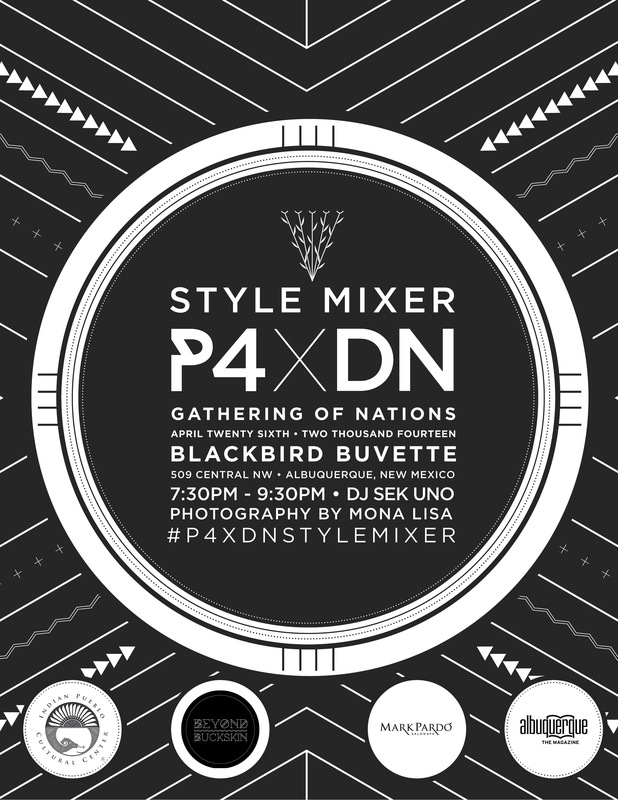 See you at the next P4 Style Mixer! !